Heute wurde das finale Line Up der diesjährigen Ausgabe der HELL ON EARTH TOUR bekannt gegeben. Mit dabei sein werden WALLS OF JERICHO, DEATH BEFORE DISHONOR, HUNDREDTH & BETRAYAL. "Our line up for this years HELL ON EARTH TOUR in September is finally complete. 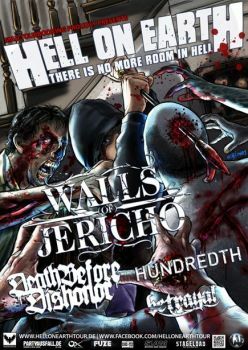 Walls of Jericho, Death Before Dishonor, HUNDREDTH and Betrayal will bring you the hell on earth again. After their few shows at this years Persistence Tour, WALLS OF JERICHO is exclusively back on your club stages to kick asses again. They will be supported by Boston's finest DEATH BEFORE DISHONOR, HUNDREDTH as well as BETRAYAL out of California. There will be some great special guests at a lot of the shows - so be excited, we have a lot of surprises prepared for you. Be syked and ready for the judgment day when the hell comes to earth!"